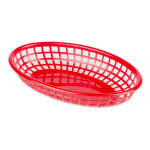 Place a liner into the bottom of this Update International plastic food basket for safe and sanitary food delivery. This fast food basket makes it easy for customers to dispose of their own trash, while also saving you time and money on dish washing. The uniform design of this oval fast food basket makes it easy to stack, for simple and compact storage.